Espira Cool Down sounds interesting to you? Now you have the chance to test this new and innovative product for free! To get a test package apply now on our Facebookpage or send us an email to testimonial@espira.ch. You just need a little bit of luck to be one of the Espira Cool Down Tester! We would be happy to hear your opinion! 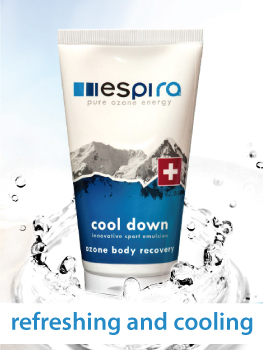 Espira Cool Down regenerates, relaxes and refreshes your muscles after sports activities. The cooling sport emulsion enables muscles to regenerate quickly through the unique formula with active oxygen OZONID. Say goodbye to feelings of heaviness, swellings or cramps!